However, not all sump pumps are created equally- depending on their design, some sump pumps will far outlast and outperform their competition. The inner workings of a sump pump are much more involved than you may think- with a little research, you can protect your basement more effectively than ever before. For a free sump pump quote, call Superior Basement Systems today! We service Ohio, including the areas of Alliance, Ashland, Cadiz, Dover, East Liverpool, Hartville, Massillon, Millersburg, New Philadelphia, Salineville, Wooster, Yorkville. 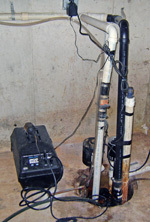 Sump pumps should be powerful- preferably, a little more powerful than you need. Superior Basement Systems prefers sump pumps that run at 80% capacity when pumping water, so they're not running at their absolute limit at all times. A good basement sump pump should be at least 1/3 to 1/2 horsepower. Be careful not to order a cheap sump pump that's meant only for temporary use, as it won't be able to keep your basement dry in the long run. A submersible sump pump is not helping you if it can't turn on, so it's vital that the sump pump uses a switch that won't snag in sump pump. 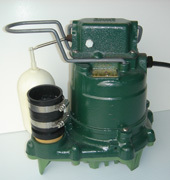 Sump pumps that use arms, levers, or ball-and-chain (also known as "ball-and-wire") designs are notorious for snagging, forcing the pump to stick in an "on" or "off" position. Pumps that are forced to remain on with no water in the pit will quickly burn out. 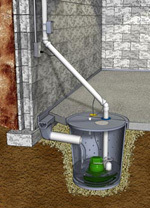 The sump pumps provided by Superior Basement Systems of Ohio includes one extra special no-clog feature. 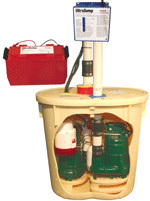 Sump pumps pull water into the system with an impeller. An impeller is like a propeller, except that it pulls inwards instead of outwards. These impellers are usually set up against the outer housing-- meaning that any debris that enters, even a small pebble, could potentially jam the impeller and shut down the system. The Zoeller pumps provided by Superior Basement Systems have a half-inch clearance between itself and the outer pump casing to prevent small sediments from jamming your pump. As members of the Basement Systems International Network of waterproofers, Superior Basement Systems has access to sump pumps systems that have been carefully researched, tested, and compared to others in the market. The network benefits from the research of a dedicated R&D company that is dedicated to finding the best, most reliable sump pumps and sump pump accessories in the world. Continually, our research leads us back to Zoeller as the best in the industry in sump pumps. As a family-owned company with more than 70 years, they understand sump pumps like no one else, and they apply their experience and dedication to quality to everything they do. Neither Basement Systems nor Superior Basement Systems manufactures these pumps- they use them because we know they're the best there are. If you're interested in a Free Estimate on a basement or crawl space sump pump installation in your home, Superior Basement Systems would be happy to help you. Their free, no-obligation visits include an on-site inspection, a conversation about the best options available to you, and a written quote. Before your visit, we'll mail you a free copy of our 88-page full-color book on waterproofing. Call or contact us today! They serve throughout Ohio, including the areas of Alliance, Ashland, Cadiz, Dover, East Liverpool, Hartville, Massillon, Millersburg, New Philadelphia, Salineville, Wooster, Yorkville.